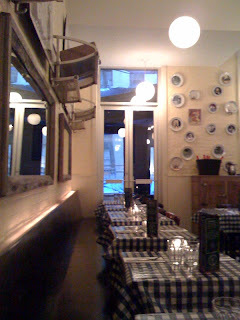 Last night we returned to Petite Abeille to try their popular Belgian specialty of Moules-Frites. 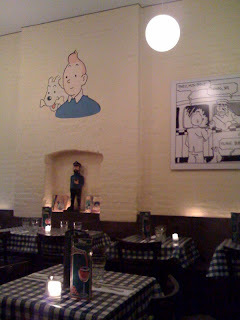 The restaurant at 5:30 pm was empty. Again, we love when we feel like it's all ours. On weeknights they have specials: Monday night is 1/2 price on their large selection of Belgian beers, Tuesday night is 1/2 price on all bottles of wine, and Wednesday is all you can eat Mussel night. 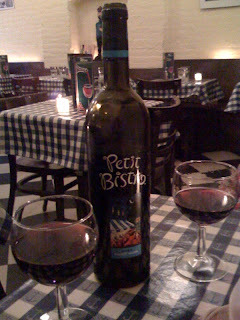 We took advantage of their 1/2 bottle wine deal (we got a whole bottle of good Pinot Noir for what two glasses of wine would normally cost). 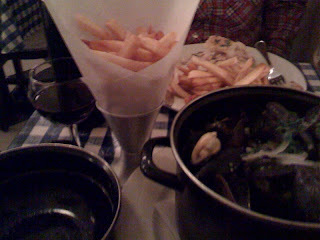 Their mussels and fries were voted some of the best in New York City. 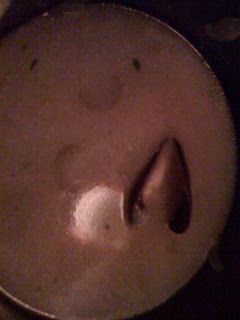 I wasn't too sure which Les Moules to choose from - mussels in a Jamacian curry sauce and crisp apple sounded very unique, then again the coconut lemongrass and ginger sauce sounded oddly interesting, the shaved fennel and light pernod sauce wans't ringing our bells, but the cream sauce with essense of bacon was really tempting. 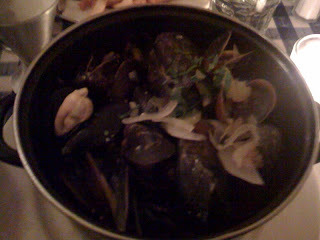 In the end, simplicity reigned supreme and we chose the mussels in white wine celery garlic broth. 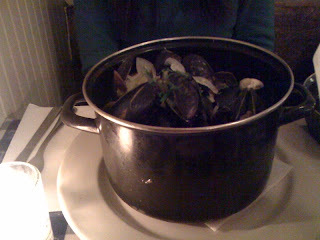 When they brought the two pounds of steamed Pei mussels to us, it looked like there was too much. But as the discarded mussels kept piling up in the once empty bowl, and as the waiter went to "refresh" my bowl and grinned at our obvious pigginess, we realized that we should have waited a day for their all-you-can eat night for just $3 more. The mussels are served with fries. I wouldn't agree with their "best fries" accolades, but they were indeed good. Unfortunately, no ketchup at this restaurant. They probably would have kicked us out if we asked for a bottle. Next time, I'm going to stop by McDonald's and grab some packets of ketchup on the way here. I don't care how damn good your fries are, eating fries without ketchup is like eating pizza without cheese - it's just not right. The reviewers were right, the mussels were fantastic. The light, garlic broth was an excellent choice, and even the onions were a nice touch. The $14 bottle of Pinot Noir (a steal at a restaurant here) was excellent. We also loved how they dimmed the lights very low to give it that romantic touch. Oh, and their music play list was a combination of Marvin Gaye, Jack Johnson, and strange Euro Pop. We were enjoying our splendid evening so much that we didn't realize the damage had been done, and before we knew it, there was just one left, and then all was gone. Recommendation: go on the all-you-can-eat mussel night.